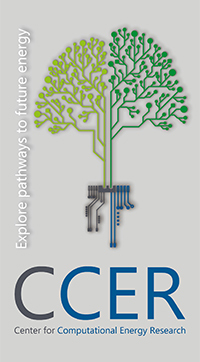 The CCER focuses on computational challenges critical to the exploration, identification and early screening of scalable energy conversion and energy storage technologies. It is our goal to provide a computational foundation for a smooth and successful transition towards a sustainable global energy system. The challenge common to almost all such computational energy research is to describe and model a variety of physical phenomena at a range of length and time scales. In order to create an environment that is most likely to evoke breakthroughs, the research program of the CCER is organized according to the length and time scales at which subjects are modeled. The understanding of the properties of materials at the nanoscale is essential in many energy conversion processes, but this understanding is often insufficient or even completely lacking. Significant progress has been made in the simulation of the core plasma in a Tokamak fusion reactor. Breakthroughs are needed now in the simulation of the ‘scrape-off’ plasma, where multiphysics and multiscale aspects play a key role. This research line is set up to guarantee that the scale-related research lines 1-3 truly get connected, which is necessary for creating breakthroughs. Even if all research lines are fully connected, and macroscopic properties of materials could be exactly predicted from their atomic compositions, finding materials that show certain pre-defined large-scale behaviors often poses a significant challenge.